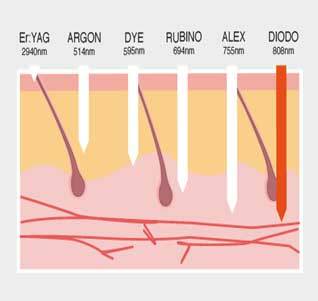 This is possible because about 90% of the laser wavelength is captured by the pigment of the hair and conveyed accurately and safely into the bulb. Very little energy, is absorbed by the skin. The exact term to define the result of laser photoepilation with our method is persistent and permanent. The effectiveness of our method is represented by the use of a high technology laser of medical derivation, combined with the use of protocols of use, resulting from many years of experience gained with the collaboration of doctors and beautician skilled in photoepilation . This allows us to guarantee fast, comfortable and pain-free treatments. Our protocols provide photoepilation with traditional CS and SP modes, but also in the new and innovative FM mode (fast mode), which offers an exceptional level of comfort and the total absence of any type of pain.